During our team trip to Louisville, KY for Bourbon and Beyond, we spent a cozy Sunday chatting over coffee in Annie’s elegant and inviting NuLu-based restaurant, Decca. While being an active James Beard Foundation member and Top Chef contestant are just two of Annie’s many accolades, we were most inspired by the journey that brought her there. 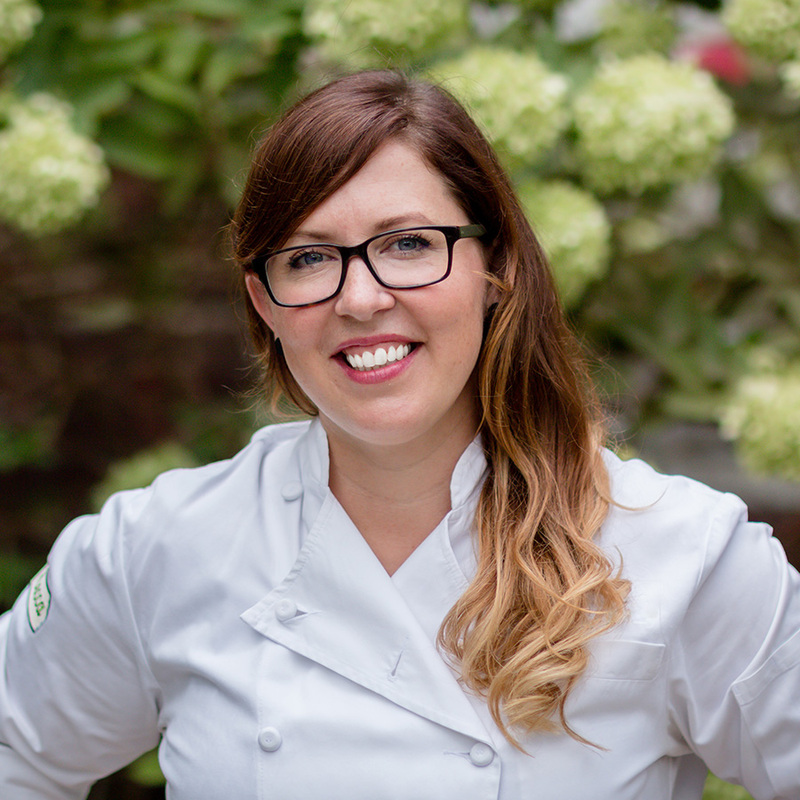 From her Asheville, NC upbringing (see: mushroom foraging, trout fishing and wood-fired cooking) to her formal culinary training in NYC and San Francisco, Annie’s hustle is made evident by the passionate, gritty and wildly talented executive chef, business owner and philanthropist she is today. I am a huge hip-hop fan. Most people wouldn’t think that, but I think in high school I only listened to hip-hop. Now, my music taste has expanded, but I still enjoy it. “The Potlikker Papers: A Food History of the Modern South,” by John T. Edge. It’s all about food in the South and the history of it all. It even has a section of hippies in the South and food, and my parents were hippies so it was really cool to see that. It’s hard not to say the time I was a guest chef on a James Beard cruise. My husband came with me and we went to Spain, Portugal, France and Ireland. That was pretty awesome. It’s a culinary cruise in partnerships with Windstar Cruises. A lot of times it’s getting up, looking through emails and thinking about a dish I have to do for an event. It depends on where I am. if I’m in town I come [to Decca] all day and deal with staff stuff. A lot of times I’m talking to the managers, because I never want to undermine anyone’s management. I would never go to the employees and tell them to do this and this; I want to go to their manager and have them do it. It’s very important to keep the management structure clear. [I spend my time] talking with the managers, looking over the guests for the night, being around for the lineup and running food or hanging out in the kitchen all night — sometimes eating food here to make sure I’m tasting everything. I don’t go to bed until 2:00 a.m. most nights. Then when I’m traveling, it varies—it’s just hustlin’ for an event. I travel two to three times per month, from two days to one week. Tell us about your culinary training. Living in New York was a big thing; just being there, and the energy of it, and being exposed to all the diversity and food at the same time is really important as a chef. As far as culinary school, it was really fun. I don’t know if I would tell other young chefs to go, because I’m still paying for it (and I probably will be forever), but it was really fun and valuable. Now that you’re so established in your career, how do you continue your education about food trends? It’s just constantly keeping your eyes open and being aware of everything. It’s partially your surroundings that tip you off to what's happening, and of course media and things online. Being active online and reading help a lot, too. But for me, the biggest thing is traveling. Going to new cities and seeing what’s happening, what the vibe is, and what the food scene is like, as well as meeting chefs in other cities and cooking with them is really beneficial. A lot of times I’ll bring stuff with me and we’ll cook dinner there and watch their style and staff, and see their walk-in [freezer] and how their restaurant runs. Tell us about Decca’s wood fire cooking. I had hippie parents. We grew up in the Appalachian Mountains with a wood stove and no central heating, so tending to the fire was just a part of the day-to-day life. I’m very familiar with fire. We camped a lot, and we cooked under the flames. We had a trout pond at my mom’s and smoked trout on an outdoor smoker. It’s just a part of me and my family. What’s one of your favorite dishes to create at Decca? One has been on the menu since we’ve been open: our wood fired broccoli. Only a couple of things on the menu have remained the same; everything else changes constantly. It’s kind of like the quintessential what-is-Decca-all-about dish. It’s cooked on the grill with amazing wood, and it’s tossed in anchovy vinaigrette and toasted almonds. It’s simple, but straight to the point with a pop of flavor. Some of our plates are a lot more involved than that, but that’s Decca at its essence. How has being a woman in your industry affected your professional experience? When I look back, there are situations where I just pushed through and rubbed some dirt in my wounds and kept going, or I didn’t notice because I was so focused on being the best I could be and pushing myself constantly. Looking back, maybe there were things I should’ve paid attention to—but I don’t really know what they are. This is a new thing I’m trying to figure out. As far as in the future, I think [what matters is] giving everyone a fair opportunity and not having a preconceived notion about them being a female or male, and who’s going to be better at something. Actually take that person into consideration—their skills and even their attitude, because sometimes you can teach people skills but not attitude. We are fair to all types of people. I don’t hire more women because I’m a woman; we’re about half and half. Are they going to be a positive influence on the business; are they going to care? On the whole, I think it’s continuing to talk about it and being conscious and aware of it. I’m one of the advisors of the League Initiative. We’re a group of female chefs in Kentucky who mentor five young female chefs per year and teach them skills to move into the next level in their career, empower them, expose them and give them some press to lift them up. What are some common misconceptions about being a chef? God, there are so many. A lot of people think its easy, and you’re just back there playing around with the food. I mean, you have to take a lot of time and care to produce a great plate of food—but there’s so much more than that, especially if you’re managing. There are so many personalities you have to deal with: your staff, your vendors, your guests. Oftentimes it can be back-breaking and be 70 to 80 hours a week. It’s brutal and intense on your body, both physically and emotionally. People think it’s all fun and games, but it’s a lot of work. You really have to love it—and be a little crazy to do it. Or, the opposite: They think you’re just out on TV, smiling with this spatula in your hand. But there’s a very small percentage of people who actually make a living doing that. Are you involved in any other community organizations or side projects? I used to try to do all of them. Anything I had any sort of feeling towards, I had to do it. You kind of spread yourself thin, and then you’re just giving a little to all of them, and it’s not making a lot of an impact. Even now, I feel like I need to hone in on one or two issues and give that my all. I’ve done the James Beard Boot Camp for Policy and Change, working on childhood nutrition. I went with No Kid Hungry to Capitol Hill and did a lot of talking to senators to talk about the farm bill to try to get SNAP benefits either maintained or approved, instead of being cut. In Louisville, the Food Literacy Project has a program called the Youth Agriculture Program. We teach them a cooking class every year, and I help them do some fundraising. What advice do you have for other female chefs? Work really hard and only compete with yourself; don’t worry about what everyone else is doing, you don’t have to be in the same place as another person. Think about where you need to grow and learn. Put yourself in situations where you have room to grow and push yourself; you might be a little uncomfortable and feel like you’re not ready to take on the challenge, but that’s where you grow the most…. You have to be strong and have stamina for sure—but don’t forget to take care of yourself first.